Everything on the island is awe inspiring. Access prohibited. Police patrol local waters. Thoughts on "Gukanjima - View of an Abandoned Island"
Off the westernmost coast of Japan, is an island called "Gunkanjima" that is hardly known even to the Japanese. Long ago, the island was nothing more than a small reef. Then in 1810, the chance discovery of coal drastically changed the fate of this reef. As reclamation began, people came to live here, and through coal mining the reef started to expand continuously. Befor long, the reef had grown into an artificial island of one kilometer (three quarters of a mile) in perimeter, with a population of 5300. Looming above the ocean, it appeared a concrete labyrinth of many-storied apartment houses and mining structures built closely together. 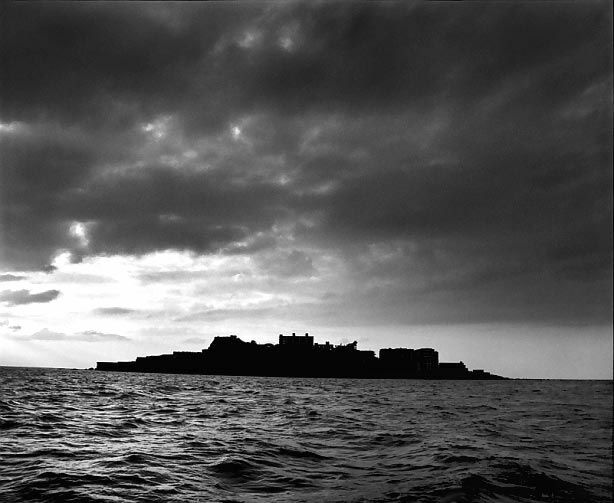 Seen from the ocean, the silhouette of the island closely resembled a battleship - so, the island came to be called Gunkanjima, or Battleship island. I was twenty-two when I first visited the island I had dreamed about ever since childhood. Much like a fortress built upon the sea, surrounded by high walls,the island possessed an air of a small kingdom, where its denizens boasted "There is nothing we don't have here." They were right. They did have everything within their miniature kingdom - except a cemetery. But, the irony of it was proven by the passag e of time. Already, the island had been doomed to turn into an enormous graveyard. Eventually, the mines faced an end, and in 1974 the world's once most densely populated island become totally deserted. The island, after all its inhabitants departed leaving behind their belongings, became an empty shell of a city where all its peopl disappeared overnight, as if by some mysterious act of God. Ten years later, I returned to the island, equipped with food and drinking water. The island was devastated, with the smell of people gone. Inside the buildings, however, evidence of people's lives remained strongly. The strange atmosphere led me to wonder if island had remained in sleep ever since all its inhabitants left. As days passed on the island, my impression of it began to change greatly. The innumerable articles left behind, all shrouded in dust, rusted,to me at first seemed merely drifting toward death. Yet, from one point in time, they started to look vivid, and beautiful. I thought perhaps the island, while appearing to fall deep asleep, had gradually commenced to awaken, the day it was deserted. Order and value that only prevailed through human existence had long been disrupted. Items were scattered here and there with no context, no ranking. Everything had equal value. The sight I saw spoke of the relationship of the master and servant that had vanished at the time these items were discarded, which liberated them from human reign. To be abandoned meant freedom from all. The items left behind on the island lost their names, their given tasks, even the meaning of their existence. They laid there, as mere "objects." Books and clocks and empty bottles were no longer books and clocks and empty bottles. Things that had been domesticated by humans no longer existed on the island. Just as the inhabitants started their new lives by leaving the island, these things too, left behind on the island, shed their identity once forced on by humans, to start their lives as "pure objects." A voyage to the Gunkanjima-island is prohibited currently. Hashima was re-opened to tourists on April 22, 2009. Increasing interest in the island resulted in an initiative for its protection as a site of industrial heritage. The island was formally approved as a UNESCO World Heritage Site in July 2015, as part of Japan's Sites of Japan's Meiji Industrial Revolution: Iron and Steel, Shipbuilding and Coal Mining. Excellent article giving an overview of the island's history. This location's validation is current. It was last validated by Steed on 2/27/2019 2:23 AM. on Oct 16 09 at 14:20, Kuroneko updated gallery picture Course Location. This page was generated for you in 61 milliseconds. Since June 23, 2002, a total of 574044910 pages have been generated.